This winter, Downtown Dubai will have the brightest nights in the city, ever. ‘The Centre of Now,’ Dubai’s must-visit tourist destination, will bring unprecedented sparkle to the lives of residents and visitors with countless festive lights creating an awe-inspiring spectacle. As darkness descends in the horizon, Downtown Dubai will shine bright in an ocean of festive lights winding through its 3.5 km Emaar Boulevard. The decorative lights, inspired by the swaying rhythm of The Dubai Fountain, will flutter merrily in the cool winter breeze, captivating the minds of residents and visitors, and celebrating the cheer of the festive season. His Highness Sheikh Mansoor Bin Mohammed Bin Rashid Al Maktoum inaugurated the festive lighting at Downtown Dubai, in the presence of Mr c, bringing to the city and the wider Middle East region, for the first time ever, the brilliant ambience of the winter season illumination that one traditionally associates with Champs Elysees in Paris and other global cities such as New York and London. The breathtaking illumination of the 500-acre mega-development by Emaar Properties also marks the beginning of the festival season in Downtown Dubai, with the community set to host a range of headlining entertainment and lifestyle activities. 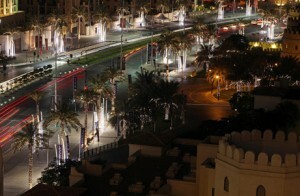 Thousands of energy-efficient decorative lights have been used for the Festive Lighting at Downtown Dubai, which will continue through the entire festival season including the UAE National Day celebrations, Emirates Classic Car Festival, New Year’s Eve and the Dubai Shopping Festival, up until April 2012. The best visual spectacle of the Festive Lighting can be witnessed from At the Top, Burj Khalifa, the world’s highest observatory deck with an outdoor terrace, or The Address Downtown Dubai, the 63-storey hotel next to The Dubai Mall. The first of the key lifestyle events in Downtown Dubai that follows the Festive Lighting is the Emirates Classic Car Festival to be held from December 1 to 3 to coincide with the UAE National Day celebrations. Previous articleConstruction work on Kingdom Tower in Jan.